This item, the Red Card, is new to Gen V. There are few people who have heard of it, and there are even fewer Pokémon sources who have written about its potential in battle. Walp, I'm here to hook you up with the deets (as in details. Look at me, using the lingo.) Pokémon Podcast is about to shoot your face full of facts, and probably facts you haven't heard before. The Red Card is an interesting addition to the Pokémon item canon. It essentially acts as a whirlwind/roar, as long as you are attacked. In other words, if you opponent hits you with a damage dealing move, they are forced to switch out. Unfortunately, it's one use only, so once it's been used, no more Red Card for you. With the basic mechanics explained, let's take a look at some situations where it can be used strategically. The first use of Red Card is for your walls/staller Pokémon, especially the ones who utilize status effects, such as Blissey with Thunder Wave, Cofagrigus with Toxic, etc. Give that staller with a Red Card and you essentially force your opponent to take another hit from your entry hazards, get a status effect move off, and have the opponent take damage from that status effect. Here is an example if you got as lost in that mesh of words as I did. The battle text is probably not exactly what the game will say, but you'll get the jist. Cofagrigus' Red Card forced Infernape to switch out! Annoying Opponent sent out Machamp. Machamp took damage from Spikes. 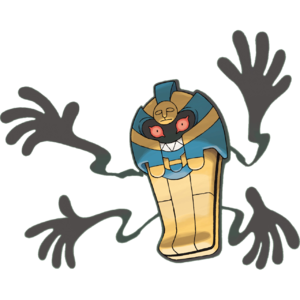 Cofagrigus used Toxic. Machamp is badly poisoned. So why not just toxic the Infernape to start with? Because Infernape is usually used as a wall breaker, Machamp is not. Your opponent is probably smart enough to know what Pokémon on your team are your walls, and would switch to their wall breaker to destroy your wall before it stalls too many of his or her Pokémon to death. Unfortunately for them, after one attack, they are forced to switch out to a random Pokémon that will be badly hurt from hazards and have status effects to start with. In this situation your opponent has the choice to either switch back to the Infernape, taking the spikes again and using up another precious turn that you probably use to recover or use another status effect attack, or to stick with the Machamp, who will probably die pretty soon, due to the damages it incurred just by switching in. It's essentially a lose-lose for them. Part 2: The Anti-Sweeper Sweeper, AKA: See You Later, Gyarados. Sorry About All Those Swords Dances You Set Up. Tired of Pokémon boosting their stats with moves like Swords Dance, Calm Mind, or Baton Pass that sweep your whole team if you slip up and don't kill them early? I've got a solution for you. Make a bait Pokémon. Train it like a normal Special or Physical sweeper so that it is completely viable even if your opponent doesn't have a Pokémon like what was described, but put a Red Card on it. Your enemy will assume it's just one of the many brittle sweepers that it will take out right before defeating your entire team. Unfortunately for them, you have Red Card. They are forced to switch out, and they lose all their stat boosts. Whoops, did I do that? That was Red Card. Later.